When I first got interested in rock ‘n roll as a teenager, I discovered the Time magazine ‘Decade’ series at the library. Of course I ended up checking out the ‘60s book the most often. I would sit playing classic rock records whist flipping through the book at all the photos of the ‘swinging sixties’. There was just something about those photos that really captured my imagination, they just seemed to capture the essence of that decade. I guess that was the first time I realized that photography was an art form within itself. 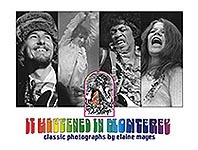 Well, I get that same feeling when I look through the book "It Happened in Monterey", a collection of Elaine Mayes’ classic photos of the Monterey Pop Festival of June 1967. Elaine was a freelance photographer living in the Haight-Ashbury district of San Francisco in 1967-talk about being in the right place at the right time! In May she got an assignment to cover the Monterey Pop Festival for Hullabaloo. Of course the book includes close-ups of Jimi Hendrix, Janis Joplin, The Byrds, The Who the Mamas and the Papas, Ravi Shankar, Jefferson Airplane, Otis Redding and many more. In addition to capturing just about every performer on film, Elaine also captured some incredible fairground and audience scenes using infrared color with filters. This unique approach really captures the psychedelic feeling of Monterey and the ‘summer of love’. Although I LOVE the pictures of the performers, my real faves are the ‘scene’ shots! 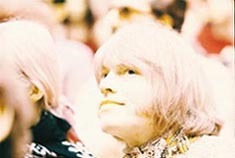 Some candid audience shots of the performers were also taken using this technique, my favorite being the psychedelic photo of Brian Jones of the Rolling Stones (who would also introduce Jimi Hendrix before he played). Another favorite shot in the book is a picture of Jimi Hendrix in a local flower market. Elaine took this photo at the beginning of the festival thinking that he was just another colorful hippie at the festival. It wasn’t until later that she realized that it was Jimi! I actually flipped through the book several times, looking at all the pictures, before I even read the text. The text includes memories and reflections by the artists that performed at the festival, plus the organizers of the event. Ravi Shankar’s horror at the smashing and burning of instruments by some of the performers is really surprising. The book is subtitled, “Modern Rock's Defining Moment” and that pretty much sums up the uniqueness of Monterey. It was the first real ‘modern’ rock concert. And although many would follow and some would be larger such as Woodstock, the magic that was Monterey was never recaptured. Lucky for us, Elaine Mayes DID capture it on film! So, here I am more than twenty years later, doing the same thing I did as a teen – listening to classic rock while gazing at spectacular photographs that capture a very special moment in rock ‘n roll history. Thanks to Elaine Mayes, I’m able to revisit those familiar memories of days gone by.